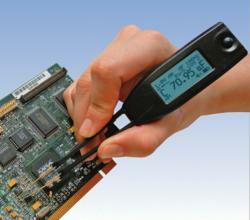 A new simplified model of Smart Tweezers LCR-meter is released. It has a lower price, but a bit lower accuracy and lower test signal level. Smart Tweezers are not cheap but, when you consider the functionality, the accuracy (traceable to NIST), the ease of use, ... a great instrument and a solid investment. A new budget version ST5L of the latest model ST5 of the world-renowned LCR-meter Smart Tweezers from Siborg Systems Inc was released. This version uses a slightly different schematics which was possible due to elimination of the 1 Volt test signal option. This allowed to use simpler schematics and fewer components thus reducing the manufacturing cost, as a result the new ST5L device is about 20% cheaper than the original model ST5. Currently Smart Tweezers ST5L is offered for $320 at the Siborg Systems Inc and SIBBIS International web site . The new model looks exactly the same as the original ST5 model except for 0.5 V test signal amplitude displayed on the screen when the device is just turned on. The amplitude can be lowered to 0.25 V but cannot be increased to 1 V, the default test signal amplitude for ST5. The only case when this little limitation is important is characterization of ceramic capacitors. It is a well known problem and it existed in the previous releases of Smart Tweezers, from model ST1 to ST3 where 0.35 V rms test signal was used. It is known that insufficient test signal amplitude may lead to up to 30% lower measured ceramic capacitor value than the actual value as it is described in the Smart Tweezers manual. A comparison of features of ST2, ST5 and ST5L are presented in the Smart Tweezers comparison table. The Smart Tweezers are indeed smart. With the use of only one hand, they correctly identifies resistors, capacitors and inductors and displays their values along with the secondary impedance components. Smart Tweezers can measure leaded components but its use for surface-mount components is exceptionally fruitful. Smart Tweezers also work well with in-circuit measurements. It can effectively be used for in-circuit measurements if you use various options that offers: manual modes and control of the test frequency, the test signal amplitude, and the resistance of the internal signal generator. One should keep in mind though that in-circuit measurements are tricky due to parallel components and therefore the actual schematics should be taken into account when doing the measurements. A dedicated Equivalent Series Resistance mode is very useful for evaluation of electrolytic and tantalum capacitors. It is known that with aging these capacitors dry-up and their ESR values increase dramatically eventually leading to malfunctioning of the whole circuit. Smart Tweezers perform very well in identification of the "dead" electrolytic capacitors. The diode mode usually works well to verify both in-circuit diodes and out-of-circuit diodes showing the polarity or indicating the faulty diodes. Smart Tweezers can also be used in a nonstandard way as a signal generator. Smart Tweezers generate a decent quality sine-wave signal at three frequencies and different amplitudes. "Smart Tweezers are not cheap but, when you consider the functionality, the accuracy (traceable to NIST), the ease of use, ... a great instrument and a solid investment." says Charles A. Schuler from Naples, Florida. Established in 1994, Siborg Systems Inc. is a source of engineering software and hardware tools for semiconductor and electronics industry. Located in the city of Waterloo, Ontario, Canada, it enjoys being part of the local world-renowned high-tech community.